Remember – Webinars are fee for PAN Members! Non-members can join or choose a sliding scale $50-10. Permaculture is a design process, which we can use to design organizations, groups, and direct actions. 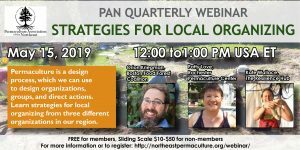 Learn strategies for local organizing from three different organizations in our region: Resilience Hub (Portland, ME), Boston Food Forest Coalition (MA), and Rochester Permaculture Center (NY). We’ll also share some lessons learned to help shorten your learning curve. As always, we’ll have some Q&A time at the end. Register here by 10 am on May 15th for access to the Live Webinar or anytime after for access to the webinar recording!